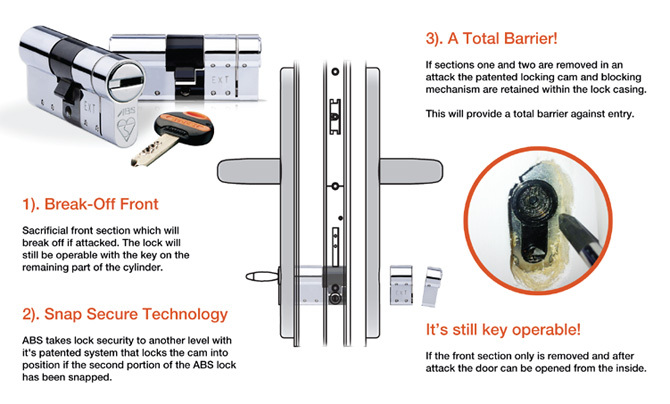 Avocet ABS Anti Snap Euro Door Cylinder Lock Barrel – High Security Pas24 Secure By Design Lock Barrels. Why purchase the ABS Cylinder? The ABS cylinder has special built in Snap Secure technology that ensures that if the door is attacked the cylinder snaps from the outside and blocks access to the internal mechanism of the upvc door lock. ABS anti snap door upvc locks feature unique patented technology that locks the cam in position when the euro cylinder lock comes under attack.These upvc door cylinders & keys are cut using specalist purpose made tooling, featuring laser cutting technolodgy. Keys for this UPVC cylinder can only be obtained through a controlled procedure again increasing security. The Multi Point Locking market is a highly competitive market place with many ‘similar’ products; product differential is vital. ERA has developed the next generation in Multi Point Locking; VECTIS PLUS – the Cylinder Free Multi Point Lock, first to market with hardened plates giving enhanced strength against attack. Patented 5 Lever operation eliminates the need for euro cylinder operation.